Julien Bachmann studied chemistry at the University of Lausanne, Switzerland, and graduated with a Diplôme de chimiste in 2001 working under Carlo Floriani on the synthesis of coordination compounds reactive to dinitrogen. He then joined Dan Nocera’s group at the Massachusetts Institute of Technology in the USA to prepare and investigate novel molecules able to store electrons at both a transition metal ion and an organic site. After obtaining his Ph. 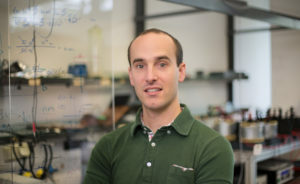 D. in inorganic chemistry from MIT in 2006, he moved with a Humboldt Fellowship to the department led by Ulrich Gösele at the Max Planck Institute of Microstructure Physics in Germany to learn the chemistry and physics of solids. He worked as a postdoc at the University of Hamburg with Kornelius Nielsch on nanomagnetism for two years, and obtained an Assistant Professor position (‘Juniorprofessur’, W1) in physics and chemistry in Hamburg in October 2009 to start independent work on energy-converting nanostructured interfaces. Prof. Bachmann was appointed as an Associate Professor (W2) of Inorganic Chemistry at the Friedrich Alexander University of Erlangen-Nürnberg in 2012. In July 2017 he was promoted to the Full Professor (W3) status, and he now leads the Chair ofr ‘Chemistry of Thin Film Materials’ at FAU. Julien Bachmann can be reached in the IZNF building on Cauerstr. 3, office 2.136, by phone (09131 85 70551) and by e-mail (julien.bachmann@fau.de).